Hobson's final draft was composed and penned by Busby on 4th February at the home of American consul Clendon who supplied the paper for it from his personal stock. At the time he also made his own copy of it. 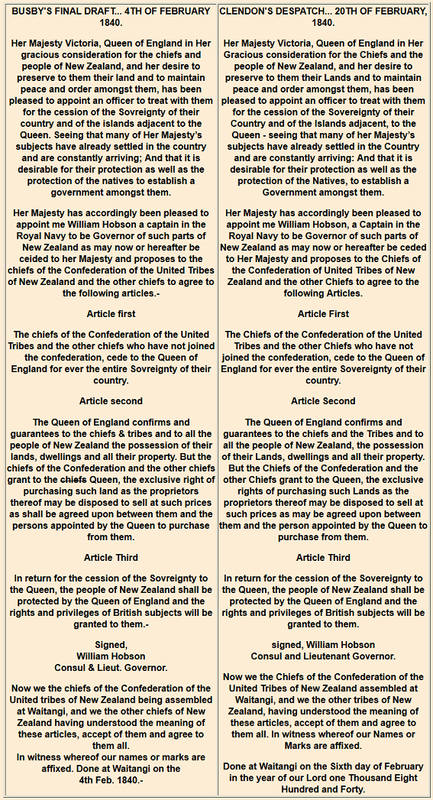 He used this as the basis of his despatch to the American secretary of state, saying it was a "translation" which merely implies that it was in a different language from Te Tiriti. He fully expected. reasonably, to get an official translation in due course but this was never made at the time. It was made at last by Young in 1869. Clendon also made it available to Wilkes who used it as the basis of his despatch to USA. This is indisputable solid fact. Clendon's copy of the 'Littlewood', tidied a little - with his covering despatch: microfilm copies are in the library of the University of Auckland. It is dated 6th, not 4th, since when he wrote it he knew the actual signing date. Wilkes' despatch with the USS Vincennes letterbook is held in an archive in Topeka, Kansas, with I understand, a microfilm copy in the Auckland University library. It is certainly copied directly from the "Littlewood draft", since it includes exactly Busby's mis-spelling of 'sovreignty' plus a few of the copyist's mistakes too! When Ngapuhi elder Graham Rankin was shown the 'Littlewood' and the ToW (in maori) in 2000 he said they said exactly the same thing - meaning of course, not word for word. 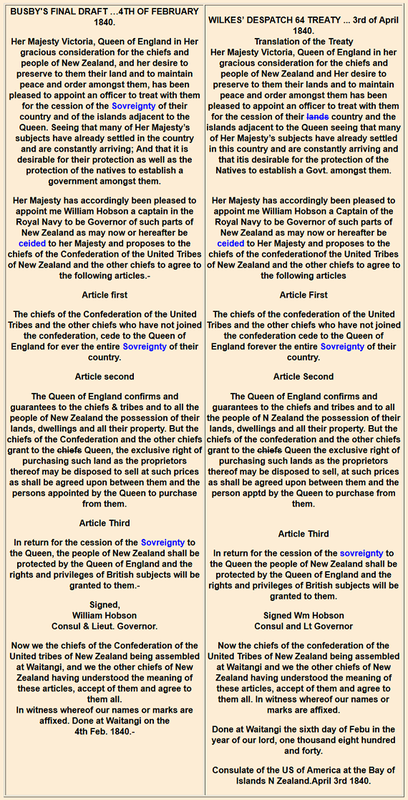 Clendon's and Wilkes' documents are strong evidence that the ‘Littlewood draft’ could be the Busby 4th final English draft that was translated into Maori which the chiefs signed.